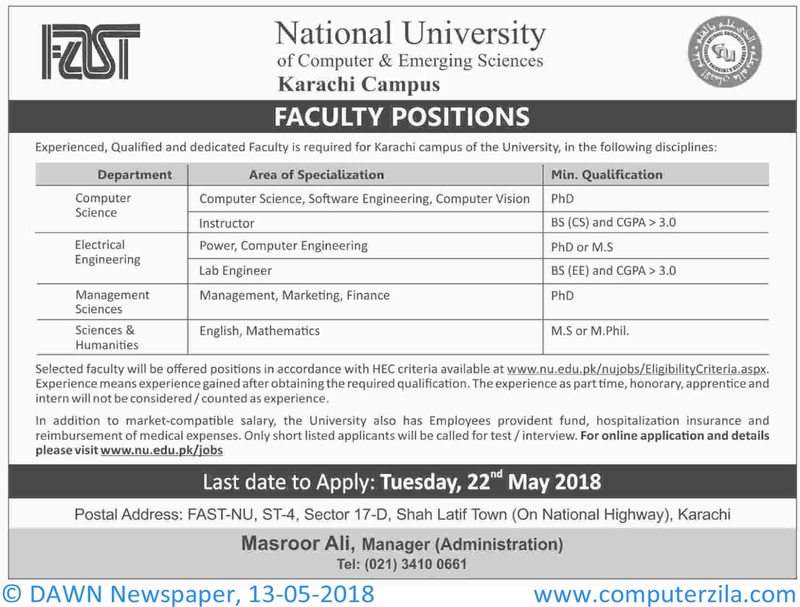 Faculty Positions At FAST at National University of Computer & Emerging Sciences (NU) in Faisalabad, Karachi, and Peshawar Cities. National University of Computer & Emerging Sciences is a Private Organization which requires employees for Teaching, Engineering, and Faculty Jobs in cities Faisalabad, Karachi, and Peshawar. Jobs Offered at National University of Computer & Emerging Sciences famously known as FAST in its three campuses i.e. Karachi, Chiniot-Faisalabad, and Peshawar. Jobs offered in different departments of the Fast university like Computer Science, Electrical Engineering, Management Sciences, Sciences & Humanities and Others,. Job Positions are Instructor, Lecturer, Assistant Professor, Associate Professor and Professors.